Please choose...Find a Local Congregation?Submit a question or topic of interest? Thinking about joining the Iglesia Ni Cristo (Church of Christ)? If you’d like to know more about the Iglesia Ni Cristo (Church of Christ), please go to the nearest local congregation of the Church and speak to a minister. You can find places and times of worship services by clicking here. Once this series of lessons is completed and the listener believes and obeys the teachings taught, he or she may receive baptism. We believe in the importance of baptism for membership as stated in Mark 16:15-16. We thank you for taking the time to learn more about the Iglesia Ni Cristo (Church of Christ) and we hope to see you soon! 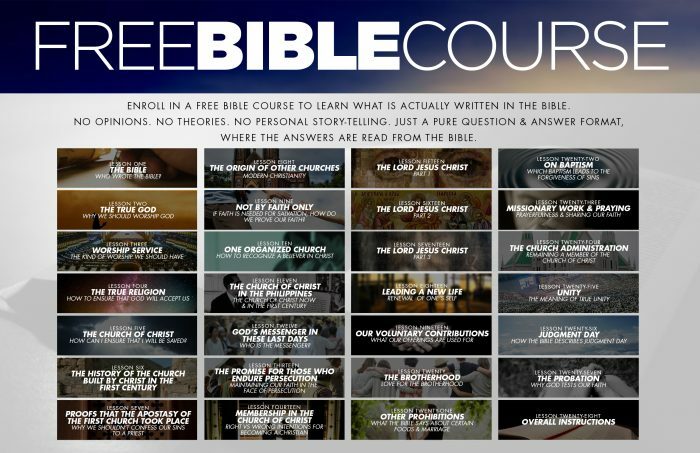 Feel free to sign up below for bible studies and you will be contacted by someone in a local congregation near you.